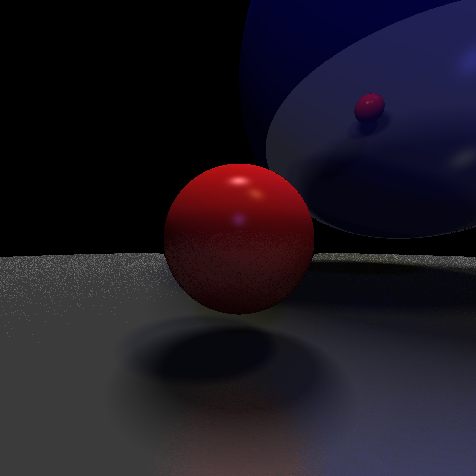 A quick update the real-time ray-tracer I’ve been working on. Calculate the current eye position and ray vector. If this not the first bounce pass, calculate the reflection amount. Calculate the ray hits, ambient light, and normal’s. For each light calculate the specular and diffuse colours. Draw the result to the screen by merging the current and the previous frames. The final result runs faster than the previous version, allows for more reflections and lights, and gives us access to modifying the lights dynamically. The difference is that this version uses 16-bit and 32-bit floating point textures to store values. This increases the need for a large video memory. The next steps will be to add refraction, material textures, and complex models. Left Arrow, Right Arrow - Rotate left and right. 3 - Show the last ambient light frame. 4 - Show the last point hit frame. 5 - Show the last ray frame. 6 - Show the last normals frame. 7 - Show the last eye location offest. Note: This example requires a browser that supports WebGL2.